Last year, 6,227 pedestrians died in the United States, the worst year since 1990. That’s according to a report by the Governors Highway Safety Association. “Crossing the street should not be a death sentence,” said report author Richard Retting. Care to guess one of the causes for these fatalities across the country? 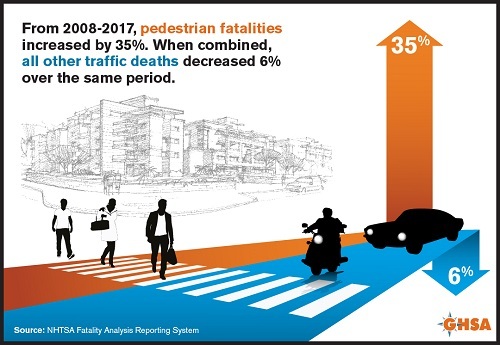 Six states (Alabama, Indiana, Michigan, Nevada, Oklahoma and Wisconsin) did report double-digit declines in both the number and percent change in pedestrian fatalities from the same period in 2017 to 2018. In Wisconsin from Jan-June 2017 there were 29 pedestrian fatalities. During the same period in 2018 there were 18, a 38% decline.